Beautifully engraved certificate from Green Bay Packers, Inc. issued in 1997. This historic document was printed by the American Bank Note Company and has an ornate border around it with a vignette of the team logo. This item has the printed signatures of the Company's President ( Robert E. Harlan ) and Secretary. 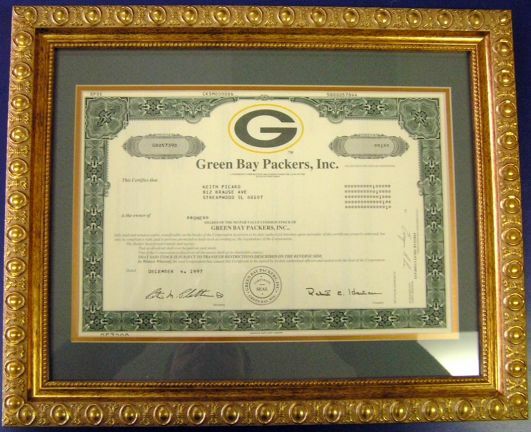 This Green Bay Packers, Inc. stock certificate is framed in a classic gold frame which is 1 1/4" wide with an overall size of 13 1/4" x 16". Archival mounting, acid free backing, and clear glass were used in preparing this custom framed authentic certificate. In 1997 and early in 1998, stock of the Green Bay Packers, Inc. was sold to the public priced at $200 per share. Shares of stock include voting rights, but the redemption price is minimal, no dividends are ever paid, and there are no season ticket privileges associated with stock ownership. Now in their 85th season of professional football (their 83rd in the National Football League), the Green Bay Packers are a team and an organization unique in both structure and accomplishment. They represent -- from an organizational standpoint -- the only publicly-owned franchise in the 32-team NFL. On the field, they have won more championships -- 12 -- than any other team in the league's history. 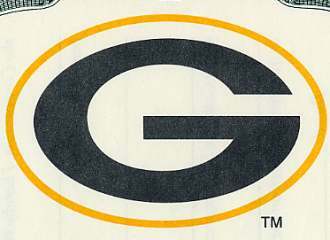 Green Bay Packers, Inc., was founded as a non-profit corporation in 1922 under the leadership of A.B. Turnbull, then publisher of the Green Bay Press-Gazette, who became the organization's first president. There are 4,748,910 shares of stock owned by 111,507 stockholders. The corporation is governed by a seven-member Executive Committee, elected from a board of directors. The committee directs corporate management, approves major capital expenditures, establishes broad policy and monitors management's performance in conducting the business and affairs of the corporation.